born bibliophile: Where do I begin? I am currently reading The Shadow of the Wind by Carlos Ruiz Zafon. It was recommended by a friend and...so far so good, I'm happy to say! I'll let you know what I think when I'm done. I'm absorbing and highlighting quotes as I go (which is a good sign), so it may be a week or two before I write a review on this one. Other than my current read, I have wondered what books I should begin blogging about. Beginnings are always difficult for me, especially when it comes to writing. So, I mulled it over for a couple of days and decided to start with a something for each age group. As I stated before, I read all types of books. First, let's start with a good children's book. The classics are well-known and well-loved. In recent years, I have a added a "new classic" to my ever-growing shelves of children's books. 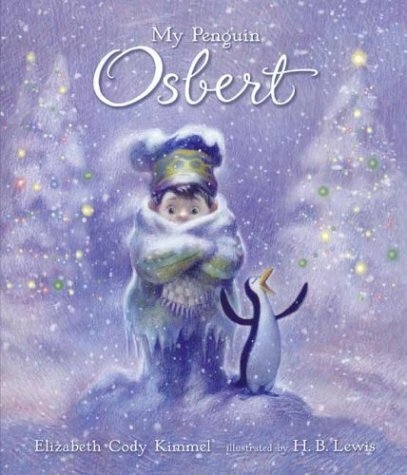 While I know that Christmas has already passed, the first book that comes to my mind is My Penguin Osbert. The story is absolutely wonderful, well-written, and the illustration are adorable. The story is about a boy who asks Santa for a penguin for Christmas. It's a great lesson in what happens when we actually get what we ask for. I originally bought the book as a gift, and I loved it so much that I bought myself the big book version and the smaller book version. I suppose I should mention that I am a pretty good expert when it comes to children's books. I've been a storyteller for children (costume and all) for about fifteen years. I watch the reactions of children to books. I pay attention to what they enjoy the most about a story. I am partial to stories that teach a good lesson, give a good hero, give a good laugh, or touches a child's heart with understanding about themselves or the world around them. When a book hits on all those things? That's the best! One more thing,...when choosing a children's book, be sure you enjoy the story. I can't say it better than C.S. Lewis: "A children's story that can only be enjoyed by children is not a good children's story in the slightest."